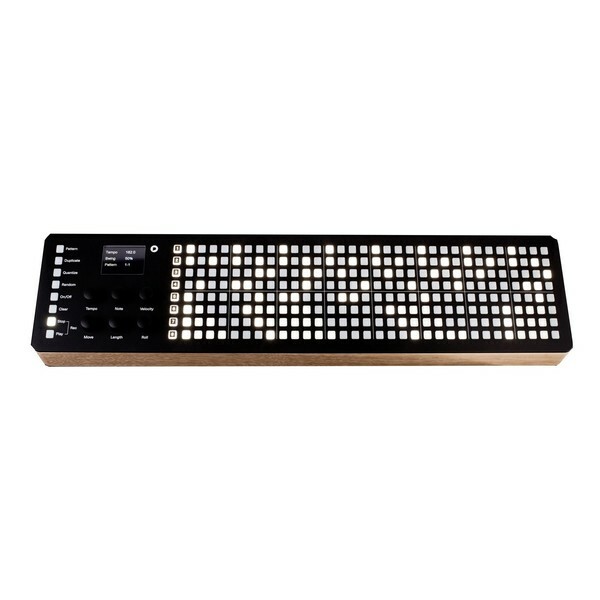 The Polyend SEQ Hardware Step Sequencer is a flexible step sequencer featuring 32 steps over 8 polyphonic tracks with 256 pattern storage. There are 8 function keys and 8 function knobs allowing you to edit your sequence including tempo, velocity, note, length, modulation, swing and more. The Polyend SEQ provides an easy way to quickly create and modify melodies and sequences with plenty of adjustable parameters. Sequences can be modified and new notes can be recorded on the go without needing to stop a sequence, handy for when performing live. The Polyend SEQ features multiple MIDI connections and a USB slot allowing your external midi devices or iPad to function with the SEQ simultaneously. You can feed tracks with your MIDI notes and every note can be assigned step by step or in real time and then quantised independently. 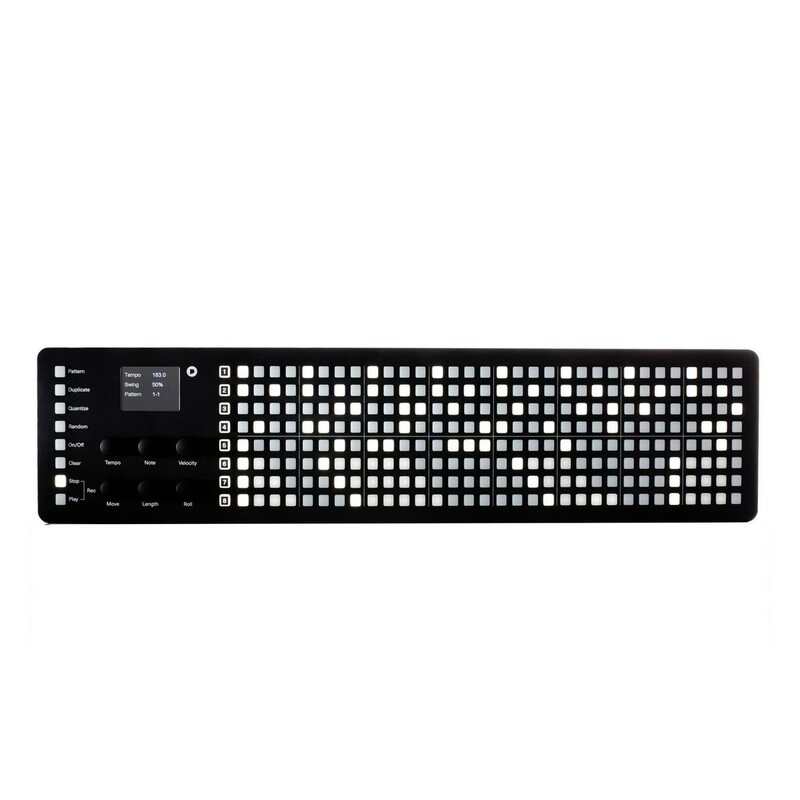 The Polyend SEQ Hardware Step Sequencer features MIDI connections allowing you to freely connect up your MIDI devices. Connect up your favourite MIDI controller and then feed the notes into the step sequencer. With 2 MIDI outs you can connect rhythm and sound machines simultaneously. The Polyend SEQ allows you to record in your notes and chords whilst playing and the SEQ records the velocity and length of these notes. Additionally once you have recorded your notes in you can then delve into the settings and adjust the length, change the steps to create arpeggios, change velocity and more. Or if you want you can add in each note step by step. The Polyend SEQ also captures the velocity of the notes played through MIDI. These can then be changed once recorded in as well. The Polyend SEQ is an ideal tool for live performance allowing you to record in sequences and bring up saved sequences. It features 256 available patterns all of which can be added or removed on the go allowing you to create new sequences or switch up sequences when playing. Patterns can be loaded up immediately, perfect for performing live. A convenient feature of the Polyend Seq is its ability to move and transpose notes on the fly without needing to stop the beat. You can also adjust notes for a track and adjust pitch on a track. Even though there are 32 steps for each track the Polyend SEQ allows you to change a tracks length so you could have your drums playing along the whole of the 32 steps and a synth across 4 steps if you wish. The multiple routing options enable you to connect up multiple devices simultaneously. There are 2 MIDI outputs and a USB slot so you can connect up a drum machine, keyboard and iPad at the same time, ideal for performing live. 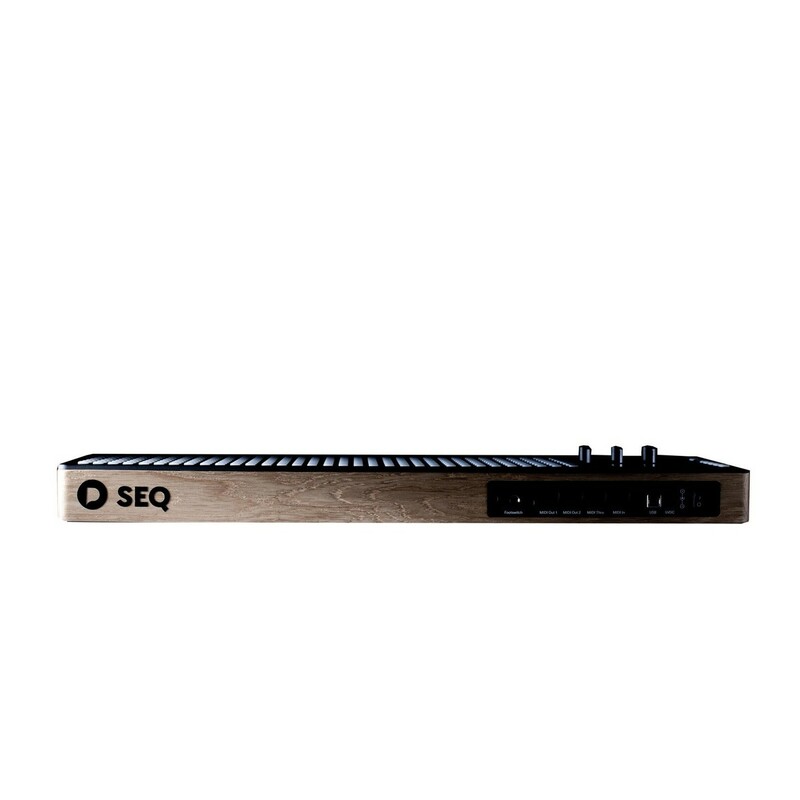 The SEQ allows you to choose which external device controls which track on the step sequencer. For example you can have the first 4 tracks controlled with the drum machine, and the bottom 4 controlled by your synthesizer. The Polyend step sequencer features a simple yet elegant design. It’s minimalist front panel removes unnecessary clutter and provides silicone sequence buttons with specially matched density and firmness that provide an instant and explicit response. The use of oak and aluminium provide not only an sleek minimal design but provide durability to ensure a long lasting sequencing machine.